Most of my projects tend to be big and complicated and take a lot of time. As a result, I have plenty of WIPs (works-in-progress): novels, quilts, me… 🙂 So I’ve decided to post about a bed quilt I’m making even though it isn’t finished yet, because it could be a long time before it’s done. 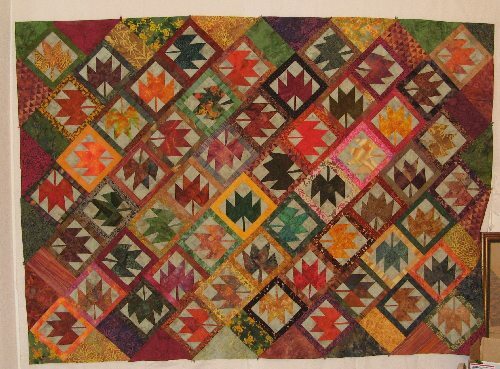 Back in 2001, I was part of a quilt block exchange group in the Tompkins County Quilters Guild. We made maple leaf blocks using batik and batik-like fabrics. I came up with an unusual layout for the blocks not long after I received them, but I didn’t actually put them together until recently. I love blocks on-point (so that they look like diamonds instead of a grid), so I found a way to do that with the blocks I had. About half the leaf blocks in my quilt were made by friends. The rest were made by me. The observant may have noticed that not all my leaves look the same. 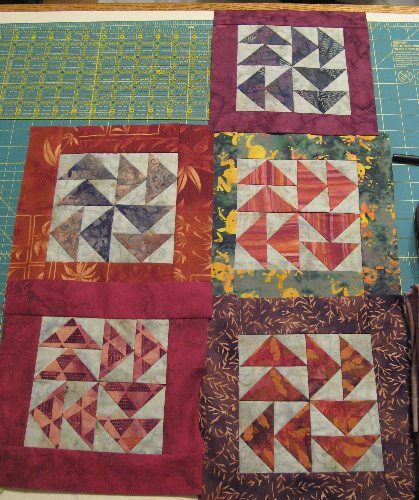 I intentionally made some wonky blocks using the techniques in Cut Loose Quilts: Stack, Slice, Switch, and Sew by Jan Mullen, and I really liked the results. To me, the odd angles make the leaves look like they’re dried and curly — like real leaves lying on the forest floor. So I mixed in my wonky leaves with the regular ones for a more interesting quilt. My current goal is to have this quilt finished within ten years of starting it, which gives me at least one more year. Ideally, though, it’ll be done in time to go on the bed for this coming fall. I’d love to have autumn leaves scattered in the bedroom at the same time they are falling outside. But I still have a long way to go. I love the way you’re playing with the concept . . . and yes to the geese! A perfect complement to the leaves. Dynamic.